At least 15 people have been killed and at least 50 have been injured in a suicide attack in Pakistan. The dead which includes women and children and a heroic duty police officer, were killed at Dargah Fatehpur in the Jhal Magsi district of Balochistan. Crowds of devotees had gathered for a three-day religious ceremony when the blast happened. The shrine is in Jhal Magsi, near the provincial capital Quetta. The explosion, which police attributed to a suicide bomber, took place at the entrance to the dargah at a time when scores of people had gathered to pay their respects. Thursdays are usually busy in terms of attendance at shrines as the day is considered spiritually significant. A regional official said the bomber had detonated his explosives after being stopped at the gate of the shrine by a policeman. The officer was killed in the explosion but manage to reduce the casualties by preventing the bomber to get to a more densely populated area around the shrine. Security forces reached the shrine soon after the explosion and had established a cordon around it. They are currently investing the crime scene and helping attend to the wounded. It is unclear who carried out the attack, but Sufi shrines have been increasingly targeted by Terror groups and agencies who are determined to create civil unrest in the strategically located country. This is the second deadly attack on a shrine in Pakistan in 2017. In February this year, a suicide bomber had killed more than 80 people and injured more than 250 in an attack targeting the busy Lal Shahbaz Qalandar shrine in Sehwan, Sindh. Many consider Pakistan to trapped between proxy war between USA and China and of course the adversarial relationship it has with its neighbour India. Since the US led bombing of Afghanistan, Pakistan has taken an influx of refugees, from Afghanistan and along with it inherited Special Forces Groups from the USA. In some ways the conflict between the Taliban rebels and Americans has been inherited by Pakistan. 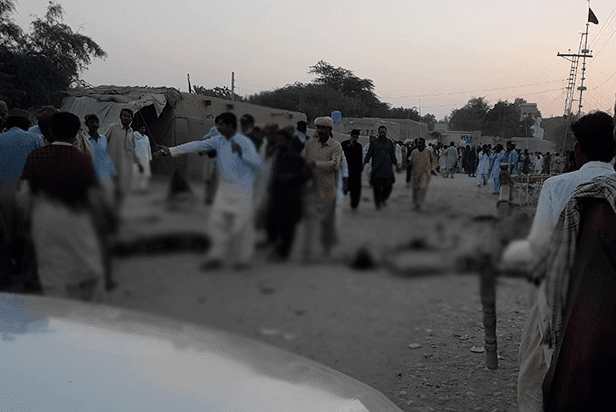 This conflict can be attributed to many of the explosions seen in Pakistan, with the civilians unhappy at how the US operate in the country and Government of Pakistan pressured by Washington to combat this unrest. With the erratic nature of President Trump last month Pakistan was given a strong warning to stop providing safe havens to militants, including the Afghan Taliban/ Haqqani network. Tense times are ahead for Pakistan as these attacks are get bloodier and more destructive each time. More breaking News to follow.